Contrary to popular belief, there's much more to football than the top three or four teams in any given country. Therefore, Portugoal.net and this blog are proud to open up their scope and pay closer attention to the other teams of the Portuguese league. In fact, it's high time we appreciated in detail the work of these teams' players and coaches. The first match of the Portuguese league's second round involved two teams with great potential, led by two bright, fiery, young coaches in Pedro Emanuel and Sérgio Conceição, enough to make many curious about this game's outcome. Indeed, the match did not disappoint and offered plenty of interesting issues to analyse - not least the fact that two teams aiming to play positively are just what the doctor ordered for the Portuguese top division. Académica started off better and by the 10th minute, they had already had two very good scoring chances, both coming from the right wing. 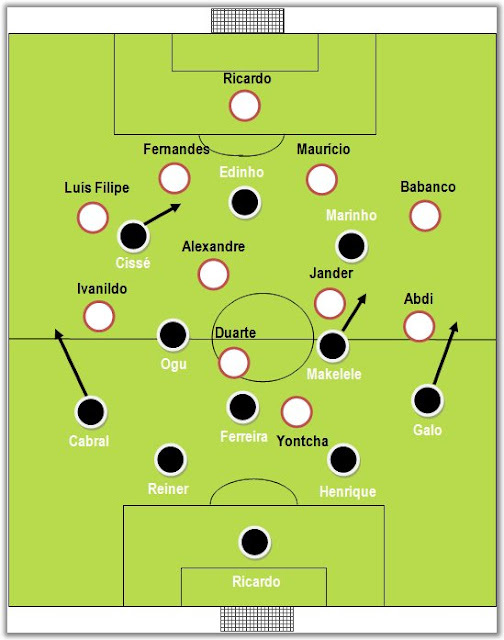 The Students were more aggressive on the ball and actually broke the tactical pattern that most teams abide by: rather than going with a more traditional 4x2x3x1, Pedro Emanuel arranged his team in a 4x3x3. Not only that, but he was also daring by instructing Flávio Ferreira (Académica's holding midfielder) to drop back, much like Javi García has done for Benfica, and be the linchpin for their attacks. 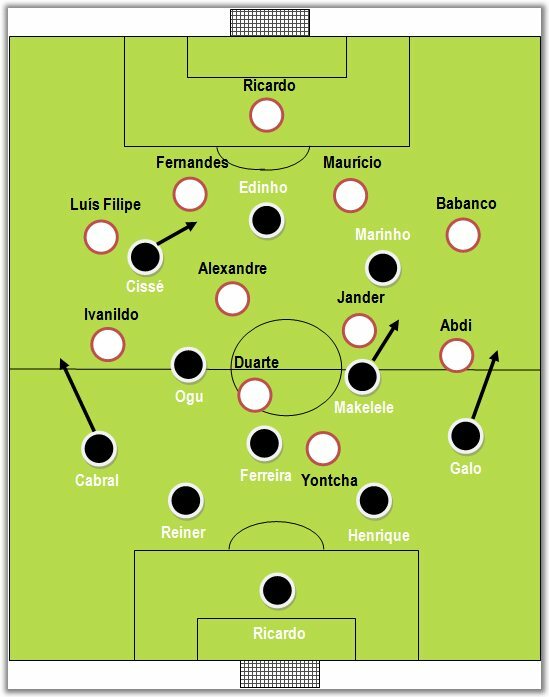 With that formation, both Rodrigo Galo and Hélder Cabral were able to play higher up, benefiting from the intelligent moves from Cissé and Marinho. Babanco (red) was not Conceição's safest defensive bet. Here he does not even provide the correct defensive coverage. he exposed the team to the outcome of Maurício's aerial duel. With Rui Duarte stranded up front just off Yontcha, Fernando Alexandre and Jander clearly had too much on their plate. Académica's wingers would often drift inward and confuse Olhanense's marking assignments. 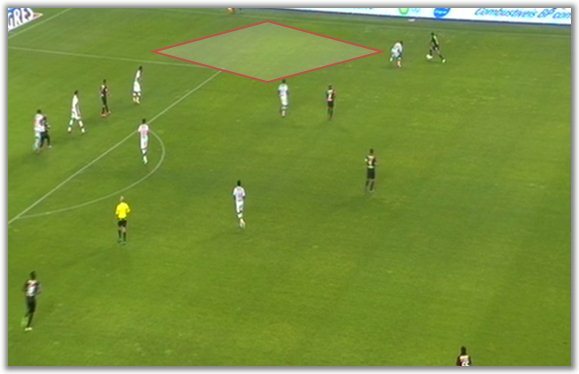 In fact, the full-backs were not sure whether they should track them inside or leave them to be marked elsewhere, which paved the way for many attacking raids from Rodrigo Galo (in the first half) and Hélder Cabral (in the second half). 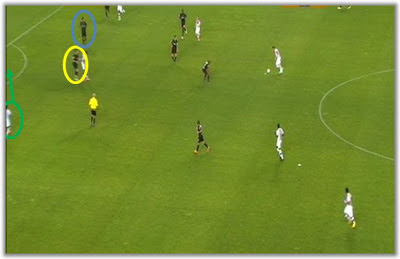 opening up space for their fullbacks' forays. Olhanense, in turn, seemed a tad lost at times, particularly because their most cerebral player, Rui Duarte, was playing too far from his preferential zone and forced to play with his back to goal. Furthermore, his presence that high up the pitch meant that Académica just kept piling up the pressure and winning back the balls repelled by the men from the Algarve. Consequently, Académica's goal was hardly surprising, given the flow of the match. If anything, it probably should have come earlier, since by then Olhanense were looking better and more like their usual selves. Conceição replaced the ineffective Abdi with David Silva, a substitution that would eventually pay off. Despite their honorable attacking intents, Académica need to improve their transitions into defence - they often commit too many men forward, away from the ball, which tends to leave them vulnerable at the back - and learn to control a match. Even though they did try to slow the tempo of the game, they weren't exactly successful in doing so and allowed a now bolder Olhanense to chase the result. David Silva's goal served to show that the 4x2x3x1 currently favoured by most coaches needs mobility. Otherwise, it can get too predictable and static. By being more adventurous with his well-timed runs, Silva was more of a nuisance to Académica's defence, who now could not afford to worry just about Yontcha. When they did just that, Olhanense scored. The two centre-backs (yellow and blue) have their eyes on Yontcha. By tracking him upfield, they left their back exposed for Silva's diagonal run. In conclusion, this was a very entertaining match that helped demonstrate the Portuguese league has plenty to offer if we just give it the opportunity. Also, it's worth pointing out that both these teams are about more than just the (necessary) points and actually try to play attractive football. Finally, Marinho played a great game and may be off to greener pastures, Makelele is a relentless worker and Cissé is clearly someone to follow up closely. His first touch, movement and reading of the game are there for everyone to see. He's not likely to spend more than this season in Coimbra.